This isn't necessarily Monrovia specific but you can find these letter grades on the restaurants, markets and pretty much any businesses that have food for sale. They reflect the results of periodic inspections by health inspectors from the Los Angeles County Department of Public Health. The "A" grade, of course, being best. The inspections are required and so is the posting of the grades. The department has a website that allows you to search many different ways (business name, city, etc.) to find not only the score of any businesses you're interested in but also any problems that may have been found. 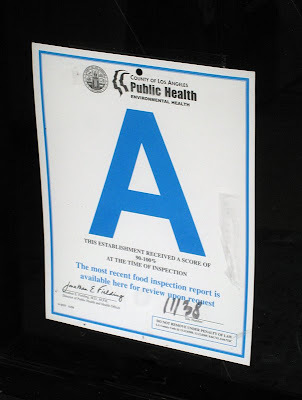 For Monrovia, out of 179 businesses listed, 164 had an "A" rating and only 1 had a rating below a "B". Great job! What is the lowest rating for a restaurant you would admit going to? If you had a favorite place you had been going to for years and found out it had a C rating, would you still go? I think about these things! Ineke: I wish there were more true "A" ratings in the financial sector these days. Pas Adj: I think about it also. Short answer - a "B" rating. Longer answer: Luckily the website shows the last 2 or 3 ratings. If a restaurant had consistently high scores then dropped to a C, I wouldn't rule it out but I would definitely wait and see if they returned to a high rating. Is the C an unfortunate fluke or the start of a downward trend.